Easter is the season of the Christian Church which marks the death and resurrection of Jesus Christ. The exact date of Easter varies from year to year as it calculated based on a complex formula based on the Jewish calendar and lunar cycles. A game of bingo is a fun game to mark this holiday. It is conducted in almost exactly the same way the standard version of bingo, but instead of playing with standard bingo cards containing numbers, the game is played with special bingo cards containing words or phrases that relate to the holiday. 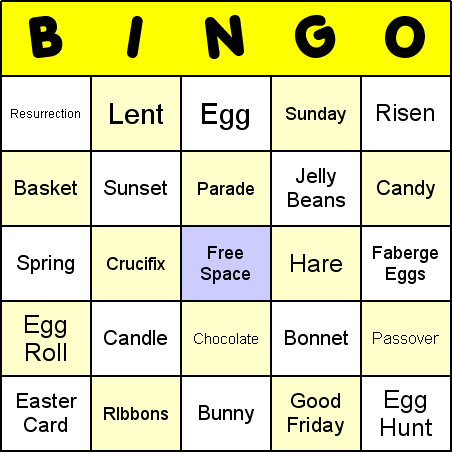 If you would like to try playing Easter themed bingo, the key requirement is, of course, getting bingo cards with the words and phrases that relate to the holiday . It might be possible purchase some ready-to-made bingo cards but they could be expensive and you may find that such bingo cards do not contain the items you want. My suggestion is to print-out bingo cards yourself, with the help of your computer. This may be simpler than you might think - All you need to do is download a bingo card maker program, and you can print out your own bingo materials in just a few minutes. One last thing that should be made clear is that Easter bingo can also be played English as Second Language (ESL) and language (such as French, German, and Spanish) education. This is because as well as being plenty of fun, but also a superb learning experience - by simply being a group activity that helps students to improve their vocabulary.